In a passionate debate in the House of Commons last week I highlighted the inequality resulting from the Government’s policies both in their impact on young people and women as well as their disproportionate affect on the North East. It is clear from the most recent figures that unemployment in the North East is rising at a rate not seen for since the mid-1980s particularly amongst the young. Unemployment benefit claimed by 18-24 year olds in Durham has increased by over 106% in the nine months to October 2011. Perhaps the most troubling aspect is the uneven way the consequences of the Government’s damaging policies are being felt. The unemployment rate is 11.6% in the North East but it is only 6.3% in the South East. Once again it is the North East that is bearing the brunt of misguided and unfair Conservative economic policies and I hope that voters in the North East will see that this is happening with the active collusion of the Lib Dems. It is time for the Government to admit that they have mishandled the economy and adopt a Plan B which should include a tax on bank bonuses to fund 100,000 jobs for young people alongside a reversal of January’s rise in VAT and national insurance tax breaks for every small firm taking on new workers. Last week in Parliament I also criticised the extensive proposed budget cuts to regional public sector broadcasting in the North East, including cuts to both BBC Radio Cumbria and Inside Out North East. Alongside other North East MPs, I spoke in a debate in Westminster Hall on the importance of regional programming to local communities and particularly their importance to some of the most vulnerable people in the region. I believe lumping the North East in with other Northern areas is simply not good enough. The North is a very large and diverse area made up of several distinct regions and merging these regions will result in regional news specific to the North East as well as vital information such as local weather, being reduced or cut entirely. I know that such information is key to the most vulnerable members of our communities, including the elderly and those who have little access to the internet and other resources. Many look to local radio for a sense of connection with their community and this is all the more vital at a time when public services are being cut and localised resources are being reduced. I hope the BBC will listen to the many important points being made about the consequences of planned cuts and think again. I was pleased to hear the announcment from Durham County Council this week that the voluntary code of conduct for letting agents will be extended for another year. The code aims to tackle the issue of high numbers of ‘To Let’ signs in some areas of Durham City. The problem of numerous advertising signs and boards being visible on streets has been the subject of much debate in the city centre, which is a Conservation Area, for considerable time. Whilst I’m very pleased to see the voluntary code will be operating again this year I feel however that the code’s requirement for the number of boards, at three per agent per street, is still too much. I think one board per agent per street would suffice, to indicate that the agent was marketing houses on that street. Secondly, I believe the length of time the boards are displayed, from 1st December to 1st March, is too great. Beginning before the students’ Christmas holiday, boards will be up for a month while no students are in Durham to see them. They should therefore be erected only after the Christmas break. I certainly welcome the other measures in the code, for example size and shape of boards, location and areas to be covered and I would like to thank Durham County Council for their work in this area. I hope they will listen to the points being made about the shortcomings in the current scheme and think again. This lunchtime I hosted a Higher Education Roundtable event on behalf of DODS, Durham University and Bucks New University. Amongst the guests who attended were Pam Tatlow, Tim Leunig, Mark Fuller, Lord Stevenson of Balmacara, Robert Wilson MP, Liam Burns and Tony Crew who chaired the event. We had a very lively discussion on the Higher Education White Paper and I would like to thank everyone for their contributions. The Lib Dem-Tory Government has made major changes to higher education funding since coming to power in May 2010. Of these, the decision to raise the maximum level of tuition fees to £9,000 per year has proved highly controversial and prompted the largest student protest ever. The Government had initially expected the top rate £9,000 fee to be restricted to a handful of world-class universities, but in actuality it has become the rule rather than the exception. The most worrying impact that these higher fees will have is on social mobility. At this afternoon’s event it was agreed that there is a real need for discussion between parliamentarians and those in the sectors to work out what can be done to make sure that everyone who has the grades to go onto higher education can do so. We also discussed higher education systems in other countries and the crucial role students and others might play in the future in improving the student experience, something National Union of Students President Liam Burns was very keen to see more of. Differing opinions from people across the political spectrum on the future of higher education funding were expressed and the value of the sessions was hearing about the issues from people who research and academics who work in the sector. With the news at the moment dominated with depressing economic stories it’s nice to finally have some positive news to blog about. First Durham has been crowned one of the UK’s eTowns, Google’s first award to recognise the area where businesses are generating the highest rates of growth through the internet. Durham came in the top 20 of the 700 towns shortlisted with almost 23% growth in 2010 to 2011 indicating that the town’s entrepreneurial online businesses are boosting growth across the area. I am delighted that in these tough times Durham entrepreneurs are turning to the internet to help boost their business prospects. Whilst it is important that our deficit is reduced, doing so without a growth plan, at the expense of struggling families and youth employment, is not the right route. I would encourage as many local businesses as possible to get online to grow and maybe next year Durham will be breaking into the top ten! Secondly last night I attended the launch of the Lumiere festival which is once again being held in Durham. Over four nights (17th– 20th) dozens of artists, lighting designers and community groups worked their magic on our beautiful city with a breathtaking series of installations and projections that illuminated Durham’s buildings, streets and bridges. The first Lumiere festival in 2009 brought 75,000 people to the city and was enjoyed by visitors and residents alike. This year’s festival is even bigger with 35 artworks ranging from large-scale projections, to neons, to installations using the latest LEDs, that illuminated the landmarks, river, bridges and streets of Durham. The festival also includes four pieces created by artists from the North East. Lumiere producers Artichoke joined forces with Newcastle Gateshead Initiative to launch an opportunity for people based or originally from the North East region. The programme called ‘Brilliant’ was developed to support artists to produce lightworks to be showcased at the festival. Four ideas were selected from nearly sixty proposals submitted by local artists, designers, students and the general public following an open call for submission earlier this year. The four artists selected after a rigorous three-stage process have spent the past few months developing their lightworks. These four ‘Brilliant’ artists are: Mick Stephenson, a local builder; Dan Ziglam and Elliot Brook of product design agency, Deadgood; Global Curiosity Group, a collective of academics at Northumberland University; and visual artist Bethan Maddocks working with theatre designer and visual artist Verity Quinn. Even in difficult economic times, art and culture are crucial in a society. Culture not only creates jobs but is an expression of creativity, an unquantifiable but integral part of an economy and a positive force inspiring innovation and progress. Future industry in our region will require creative capital if we are to lead the way on green technologies, an industry that has already established its routes here with the Nissan Leaf and wind turbine manufacturing. Along with other North East MPs I am actively promoting this new industrial agenda to create 21st Century jobs and growth in the area. With the support of institutions like Durham University with its wealth of scientific knowledge the North East can pioneer this new industrial sector. For more information about the Lumiere Festival visit their website here and the full schedule of events can be found here. As youth unemployment hits record levels are we facing another lost generation? Another week and yet another set of dire economic news as a result of the Lib Dem/Tory Government. Youth unemployment has for the first time topped one million in this country and in the North East the situation is extremely troubling. It is clear from the breakdown of the figures that young people in particular are bearing the brunt of this government’s economic policy. The verdict is in: this government is failing an entire generation. Whoever the government tries to blame, the fact is Britain’s economic recovery was choked off a year ago and unemployment started rising again well before the recent eurozone crisis. We know this because unemployment rates are time lagged. Since January there has been an 81% rise in young people on the dole for over six months in Durham. The real worry is that we are seeing the scar of long term youth unemployment return to our area. Two weeks ago I attended a breakfast in Durham hosted by the education company NISAI which was all about ‘NEETs’. For anyone who hasn’t come across this term before it refers to 16- to 24-year-olds ‘Not in Education, Employment or Training’. Representatives of the company, academics and youth workers all spoke at the breakfast alongside myself on these young people’s plight which costs the British economy £32 billion a year. The latest Department of Education figures published on the 25th August 2011 revealed that from April to June this year there were 979,000 16- to 24-year-olds were classified as NEET, 54,000 more than the previous three months and up 109,000 more than the same quarter the previous year. This is the largest rise since 2000 when the figures were first compiled. According to the 2010 Audit Commission report ‘Against The Odds’ NEETs have poorer life chances than their peers and are more likely to be a long-term cost to the public purse. Young men who are classified as NEET are also three times more likely to suffer from depression, and five times more likely to have a criminal record, than their peers. I came away from the breakfast glad that there are organisations trying to tackle this problem but worried that we are facing another lost generation in the North East like we did in the 1980s. Quite simply the Lib Dem/Tory Government are cutting too far and too fast, it’s hurting and it just isn’t working. Labour has set out a clear five-point plan for jobs, to help struggling families and small businesses. Details of Labour’s plan can be found here. Labour’s 5 point plan for job and growth would get our area moving again. For example Labour’s youth jobs fund, paid for by a tax on banker’s bonuses, could get 5,500 young people back into work in the North East. We need to get people back to work and off benefits, or the scar of unemployment will do long term damage. Whilst it is important that our deficit is reduced, doing so without a growth plan, at the expense of struggling families and youth employment, is not the right route. At the moment we are stuck in a vicious cycle, with more people on benefits and out of work the deficit is harder to get down. We’ve now had 18 months of this Conservative lead coalition Government and as Labour predicted the economy under David Cameron and his Chancellor George Osborne is flatlining. The latest national economic growth figures are bad enough but when you look at what’s going on in the North East the situation is truly dire. 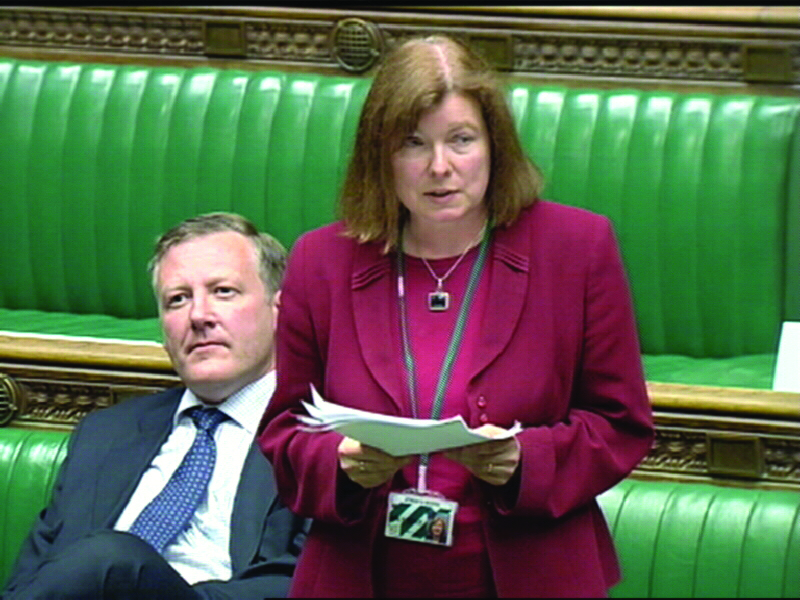 Yesterday I took to the Chamber to challenge the Government Ministers on their mishandling of the North East economy. A mixture of large increases in unemployment and economic inactivity rates, marked falls in house prices, and significant increases in personal insolvencies all contributed to this ranking according to a recent report by economists at PricewaterhouseCoopers which I quoted from in the Commons. The report even warns that “The North-East will continue to suffer some of the worst effects of the spending cuts”. Meanwhile the South-East is expected to grow most strongly this year with London enjoying the strongest earnings growth, the steadiest house prices and one of the lowest increases in personal insolvencies. In the evening, Question Time was broadcast from Newcastle. When an audience member asked the panel about the economic troubles in the North East Nadine Dorries, Conservative MP for Mid Bedfordshire, and Lib Dem Michael Moore, Secretary of State for Scotland, claimed that the Government was doing all it could to support the region. This is just not true. Government policy is not addressing underlying regional inequalities. The abolition of the RDA ‘One North East’ was ill conceived and the Coalition Government’s replacement – the Regional Growth Fund – which Mr Moore cited is neither strategic or large enough to address regional disparities. Over the next few months I intend to put pressure on the Government to address this growing North/South divide as a matter of urgency. The response I received from the Leader of the House in the Chamber this week was complacent and pathetic. It showed no real concern for the people of the North East who are losing their jobs and livelihoods. To find out more about what’s going wrong with our economy under the Conservatives and the Lib Dems you can read the full PWC report here. This is a really worrying time for families, struggling with higher food prices and gas bills and worried about their jobs and their children’s futures. The Labour Party has set out a clear five-point plan for jobs and growth, to help struggling families and small businesses. For more on Shadow Chancellor Ed Balls’ plan just click here here. Last Thursday I held a public meeting in Durham to gauge views on the latest development proposal for Mount Oswald. Even though I had received over 100 letters on this issue I was astounded at the number of people who turned out. 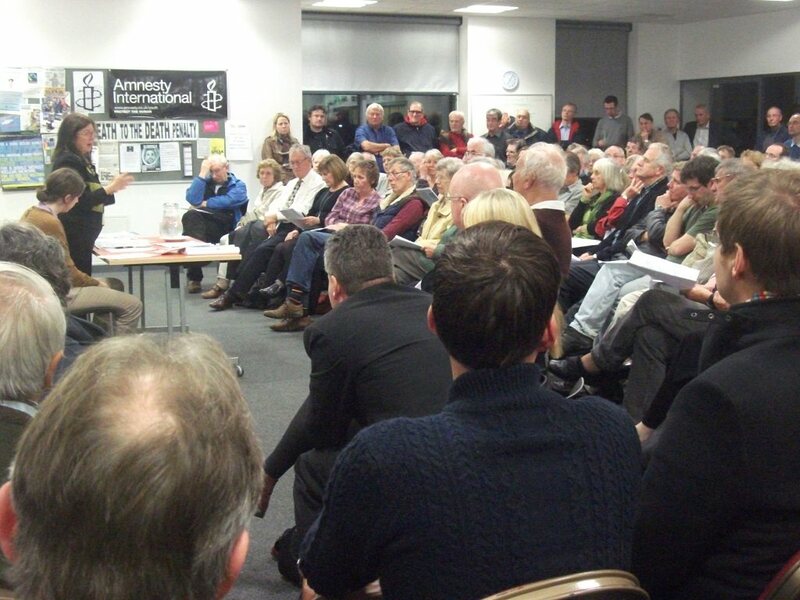 Over 200 people came to talk about the proposals and as you can see in the photos it was standing room only! The strength of feeling from local residents was evident. 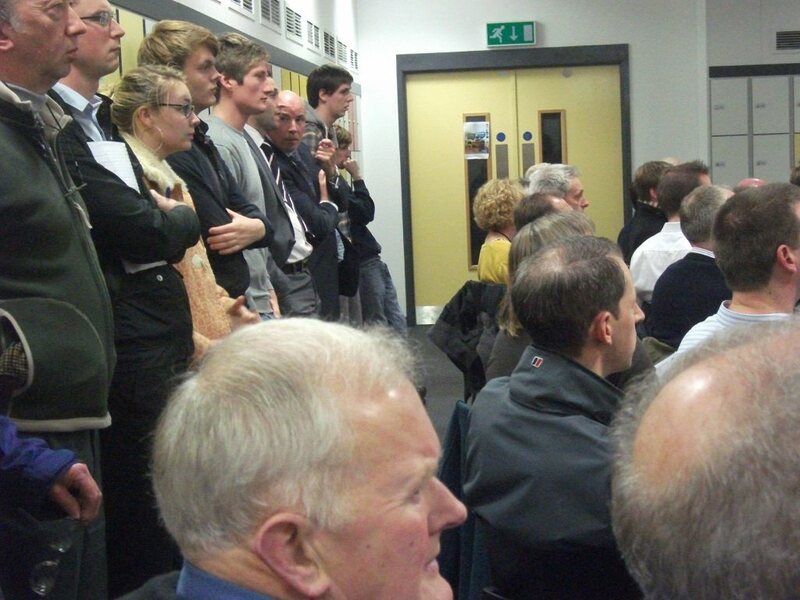 Even though it was an emotive topic the meeting was well structured and looked at all of the aspects of the proposals, not just the student housing as the report in the Echo suggested. I was really impressed that attendees had read up on the proposals and gave detailed comments and intelligent criticism. On the whole the meeting was very unfavourable to the proposals for housing and community facilities on this site. People attending were very worried about the loss of green space and the negative impact increased traffic would have on the area. The meeting also discussed the need to have the Mount Oswald site removed from the County Plan which is currently being consulted on. I encouraged those attending to write to the County Council about this matter also. I urged those attending to write to the County Council about the proposed development to make their views known. Following the meeting I attend to write again to all concerned and to send out further details resulting from this action.